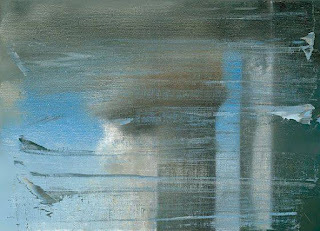 Like Picasso, Matisse, Pollock and a host of iconic 20th century painters, Gerhard Richter has developed a signature visual vocabulary of sometimes photorealistic images obscured to varying degrees in scrapes, blurs, flecks, and pulls of wet and dry paint. Evoking at once powerful movement and misty tranquility, his works require a commitment of effort and time to absorb. His “September” (2009) utilizes this technique to stunning effect. Two silvery twin towers, the tops of which disappear into monumental clouds of opaque browns and blacks, stand defiantly against horizontal winds of scrapes and streaks and blurs. The painting captures a moment of enormity with grace and respect and breathtaking radiance.